Growing up (it was, alas, the ’70s), I remember having just a few Wacky Packages mixed in among the piles of somewhat organized baseball cards. I remember a few of them stuck to the closet door as well – that didn’t go over quite as smoothly as I’d have hoped. For some reason, “Chock Full O’Nuts and Bolts” stands out in my mind. I slightly recall “Rice A Phony,” but where is this all going? 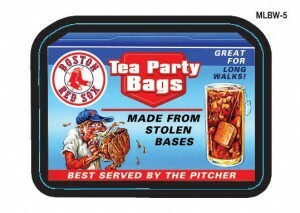 Topps has introduced the first MLB Wacky Packages set, launching tomorrow, and have let out a few images. Of the ones I’ve seen, the Red Sox drawing (above) feels the most true to the form — a slice of pop culture with three (!) taglines to draw at least an admiring groan. Best served by the pitcher, get it? You can check out a few of the others here.